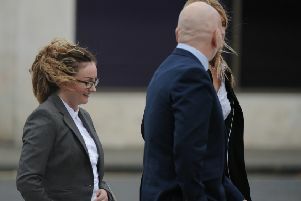 A schoolgirl has told a court how an American Akita dog called Chaos chewed through a fence to get into her garden, bit holes in the trampoline she was playing on then bit her sixteen times during a savage attack. The dog’s owner, Brian Ralph, denies a charge under the Dangerous Dogs Act in relation to the incident and went on trial today (Thursday) at Kirkcaldy Sheriff Court. The girl - now 14 and who cannot be named for legal reasons - told the court she had been playing with her cousin in their garden on a warm summer day last July when the attack happened. The girl said he bit holes in the fabric they were bouncing on - prompting her to get off in a bid to summon help from her brother. “He put his paw right down my back - right down the middle. The girl added: “I thought I was going to die - I felt like I couldn’t breathe. Ralph (24), of Methil, denies a charge of being the owner of a dog that was dangerously out of control in Lomond Gardens, Methil, on July 20 last year.